Isn’t it funny how we can have the best of days, and the toughest days all at the same time? Every day is a battle right now, and I would like to be real enough to say that tonight my emotions are not in the mood. I talk about believing, having faith, and thinking positive in every area of life; and whilst I truly believe in this with all my heart. The truth is we are human beings at the end of the day, our emotions can sometimes get in the way. 1. Choose to live a life by our feelings, for ourselves, caught up in the web of materialism. 2. Or we can choose to live a life bigger than ourselves, and embark on a journey that doesn’t just seek to gain for themselves, but to gain (having impact) for their families, and the lives of others. The truth is that if we should choose to live by the second option… It is flipping hard, and really does require us to sit down, and count the cost. Although I personally choose the second that doesn’t mean I won’t feel the way I do this evening, which is frustrated by the unknown. What do you do when you see that dream, or desire happen for other people, and yet for you things seem to remain in the distance? I guess it comes down to two things: Are you willing to remove those high expectations we can often place on ourselves, and are we willing to persevere and believe anyway? Please understand this is just a moment of realness, and (humour) whilst I could have easily refrained from sharing this. It would be unrealistic if you read my blog often enough, to say that doing the right thing feels good on every occasion. It really doesn’t, but what I do believe (and shall encourage myself with) is that good things come to those who wait… Timing is everything. Living in a fast food generation, you can at least imagine how much of a challenge this can be. Thank the Lord these are only moments, which will pass; and when I wake tomorrow I will have enough faith to pick myself up and believe again. 1. Who do you say you I am? 2. What am I here to do? Whether these particular phrases strike a chord with you, or not. I guarantee that at some point in your life, you have asked yourself these two questions on one or more occasions; and in some shape or form. Directly, or indirectly. Knowing the answer to both is not a simple flick of a switch, but a journey made up of adventure, trials and tribulations. This is journey of a life time. The more we understand who we are. The greater peace, happiness, and success we will have in every area of life. What do you stand for? What are your strengths? Those things your good at? What do you value, and believe in? Everyone believes in something. Positive, or negative. Before we build anything in life, it’s vital that we know who we are; more importantly that we believe in who we are. Failure to do so results in comparison, disappointment, and the lose of heart – Not a good combination. “The value of identity of course is that so often with it comes purpose.” Richard R Grant. 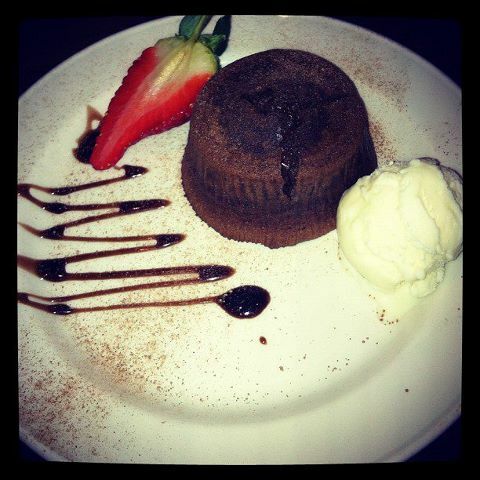 Below is a picture of the beautifully presented dessert served up by my local Chinese resturant, not so long ago, labelled on the menu as Chocolate Souffle. If you’re a wordsmith then you will have noticed the deliberate typo in today’s title to co-inside with today’s story. Souffle, and soufflé (which I can presume was the intended spelling) hold two very different meanings. According to my dictionary, souffle represents the murmuring, or blowing sound heard through a stethoscope, and soufflé, which many will recognize as the light spongy dessert made typically, by adding flavoured egg yolks to stiffly beaten egg whites are agreeably independent. Besides the small typing error, which I could easily overlook. It was the description tag that let me down. There was no gooey chocolate centre. Let this be a lesson that just because something looks good, doesn’t mean it tastes good. Don’t get me wrong, I love this restaurant for what it is. However; I am a dessert queen, and as good as this baby looks, it was a little overcooked on the inside. To gain a winning dessert in life, business or campaign; “taste must be married to luke.” In other words, our work, our relationships, our words and our actions must carry authenticity.